I recently came across this striking and significant reminder of our local community’s Cold War history resisting Lithuanian captivity within the Soviet Union. 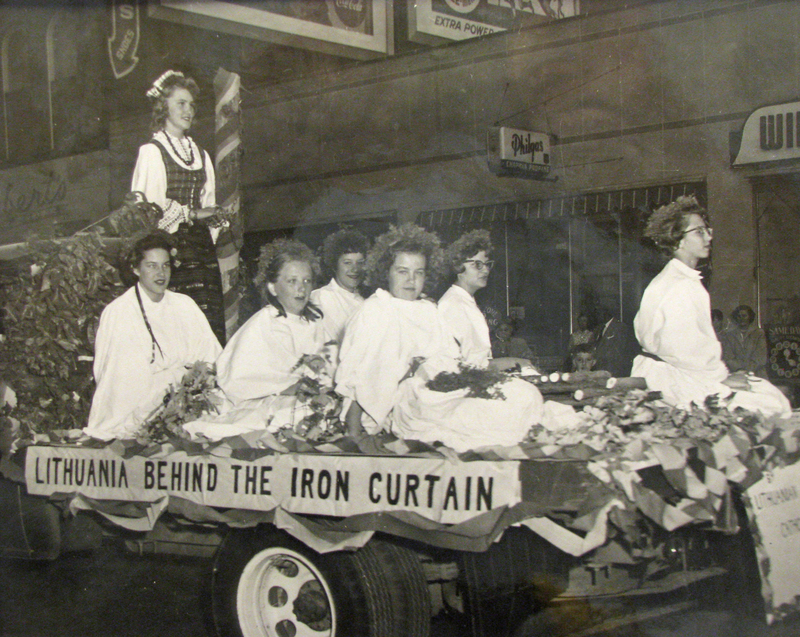 “Lithuania Behind the Iron Curtain” was a float that took part in a downtown Springfield parade, possibly on Columbus Day or Veterans’ Day, circa 1955. In this photo, Violeta Abramikas Abad, then in high school, is standing at rear, representing the captive nation of Lithuania. 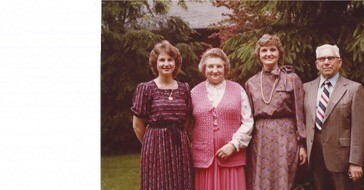 From left: Regina, Stephanie, Violeta and Walter Abramikas, circa 1980. The girls in white with Violeta on the float represent “Vaidolutes,” vestal virgins guarding the eternal flame of Lithuania’s national spirit and independence. The flame is represented by a symbolic campfire made of sticks in the center of the float. The girl in white sitting right in front and wearing glasses is Romualda Sidlauskas Capranica. Behind her is Bernadine Staken Mikels. Other girls on the float include: Pat Urbanckas Mathews, and across from her to Violeta’s right, Pat’s sister Donna Urbanckas Frost. In front of Donna is Otilija Uzgiris, and some think the girl in front of Otilija is Marilyn Urbanckas.